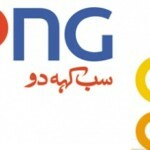 Zong is one of the most popular networks in Pakistan. Low calling rates and unexceptional packages are one of the reasons for its popularity. Zong bundled packages always include features of making calls, chatting and surfing the web at no extra cost. It has a wide range of packages according to user’s ease and convenience, so they choose best for them. 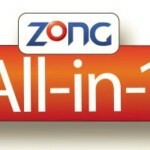 All in 1 bundle is a fantastic series of call packages by Zong. After daily and weekly bundles, Zong has introduces all in 1 monthly package for its prepaid users. Zong has made it easy for its customers to subscribe all in 1 monthly bundle. You just have to dial *6464# and then press 4, reply with the monthly option from the provided menu. You can also send SMS “Manthly500” to 6464. After successful subscription, you will receive a confirmation message from Zong. If you want to stay connected with your off-net friends, then Zong is giving 1500 Zong to Zong minutes. Don’t miss the chance to call your off-net as you will be provided with 150 minutes for other networks. Start chatting or texting now with Zong 1500 SMS for all local networks in Pakistan. Get access to free web surfing and unlimited data usage with 1500 Mbs of mobile data. Get unlimited minutes for on-net and off-net calls, free messages to any local network and internet access at just Rs 500 for a month. There should be sufficient balance of Rs 384.7 + tax in your mobile to subscribe the offer. Charges are not inclusive of taxes. No additional or extra fees are included. What are terms & condition of the offer?? Offer is valid for 30 days after subscription. Only prepaid customers of Zong can subscribe this offer. After the consumption of allocated resources and in case of offer expiration default rates will apply. This offer does not entertain any international calls. Allocated Mbs are valid for all 2G, 3G & 4G users. FED and advance income tax will apply on recharge, bill, and others usages. How to UN-subscribe the offer?? Dial *6464# choose 4 for all in 1 offers and then reply with desired bundle and press 3 to unsubscribe the monthly package. You can also send SMS for un-subscription type “Unsub Monthly500” and send it to 6464. You will receive a confirmation message shortly. Zong all in 1 bundle will give you the freedom to make unlimited calls not only on on-net friends but to off-net friends as well, in addition to this it also gives you unlimited messages and access to unlimited mobile data. Subscribe to all in 1 monthly to get endless fun for a whole month.